If Jeremy Saulnier's Blue Ruin had played the drive-in circuit 40 years ago, I'm certain people would still be describing it as a classic. Critics are citing the Coens and Quentin Tarantino, but I don't think Saulnier's originality is getting the props it deserves. When Eve Plumb, of the dire Brady Bunch, does the acting of her life just by gazing in bad-witch fury at a home invader, shouldn't the director get a little credit? Saulnier achieves great silent density, and that's what twists the knife in this thriller, and makes you want to shout at the screen in the moments of tension. As Dwight, Macon Blair is a car-dweller in a Delaware beach town. Saulnier's eye for this limits-of-the-world living is keen, as when he shoots the illuminated hub of a Ferris wheel to look like the eye of Sauron. This transient learns, from a cop who knows him, that someone from his past is about to be released from jail. As that line from A Tale of Two Cities has it, Dwight is now "recalled to life" and he heads out to track down the ex-prisoner. But what seemed like a simple act of revenge is complicated. It hadn't looked like it, but Dwight actually has something to lose. And in his fury, he hadn't considered repercussions. Blair's hapless vulnerability is key to the danger and the pathos; shaved and cleaned up, he looks about as bloodthirsty as David Byrne. Saulnier has an eye on the divides in our land: the differences between the rich and the poor Americas, and the differences in the worlds of men and women. The film has its share of bloody shock, but one of its biggest surprises is a jump from a milieu of knife fighters to a domestic scene of a mom, two children and a babysitter. 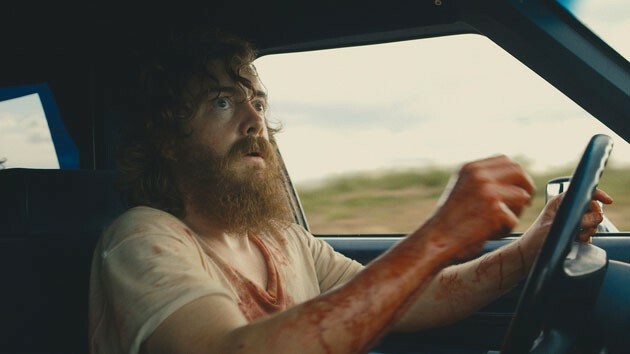 Blue Ruin's title is enigmatic—it could refer to a beat-up car or a bug zapper. The important thing is that this is a film that knows what it's talking about: a man out of his depth, the guns that sink him down, and the inadequacy of manning-up as a solution to an unhealable tragedy. 'Blue Ruin' is now screening at the Rialto Cinemas in Sebastopol.